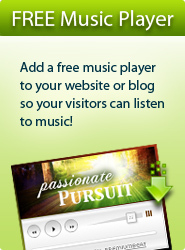 Discover free Christian music videos from The Secret Place. These Youtube Christian music videos focus on drawing us deeper into God and His presence. The Secret Place is not just a listening experience, it is a journey of worship. It is a place of intimacy with the Father where the heart longs for His touch. Take a little time to watch this Christian youtube video and soak in God. With an emphasis on intimacy and prayer, this worship song is sure to capture your heart, and leave you with an enduring sense of His presence, and a hunger for more. I encourage you to draw aside and soak in the secret place of His presence. A morning prayer - to be with the Lord, and to walk with Him throughout the day. A spontaneous song. This little gem came at the tail end of a 20 minute "free worship" time that I had one morning. The original audio file (piano and lead vocal) is an unrehearsed and live recording. The instrumental arrangements and backing vocals were added later to give a little more substance to the song. Hope you like it. Don't forget to "be" with Him today! "Don't forget to be with Him today!" Watch all our Christian videos on YouTube. Like Our Christian Music Videos? If you liked this song Be With You, we offer it as a free mp3 player for your website or blog. Click below to get the code and start using it as background music now.